Sometimes, blogging can feel like a complicated task. Headlines. Word choice. Stories. Subheads. Simple sentences. Rhythm. Active voice. Clinchers. Openings. Metaphors. Etc. Etc. Etc. Does it feel a tad overwhelming? Let’s go back to the basics today. Which writing techniques do you need to master? How can you touch readers with your words, make them feel valued and inspire them? An inspirational post without an enticing headline is like a scrumptious cupcake in a colorless box. Nobody peeks into the box to see what’s inside. Nobody takes a bite to savor its delights. Tell them what they’ll learn in your blog post: How will you make their life better? Which problem will you help solve? Your opening paragraph is like a first bite of an unknown dish. And your blog readers are fickle eaters. If the first sentence is chewy or the first paragraph is bland, they’ll quickly give up. They’ll look for a better treat elsewhere. So, set the tone with digestible sentences with a promise of more scrumptious goodness to come. You may think eating is easy. But have you ever felt out of place in a foreign country, unsure what’s expected of you? In my twenties, I worked as a tour leader in China, and on the first night of each trip, I’d explain how dinner works. Firstly, you don’t order your food for yourself. We share. Secondly, I explained how to use chopsticks, and that it was okay to lift your bowl of rice close to your mouth so you wouldn’t drop half the food on the table. As a blogger, you’re a guide, too. You help your readers step by step to solve a problem or achieve an aim. What are the basics you have to teach your readers? And what are then the next steps? Take it easy, my friend, you don’t have to teach a full curriculum on Chinese cuisine at your first date. I’ve not traveled to Asia recently. But some of the food experiences have stayed with me for ten or twenty years. When I close my eyes, I can feel the humid heat on my skin again, and the butterflies of excitement in my stomach. I can almost smell the chicken sate. I picture the guy delivering drinks who, according to my husband, looked like the late singer Jeffrey Lee Pierce. I take a big gulp of cold beer. Want your readers to remember your words, too? Zoom in to paint a vivid picture. Let readers experience your words. Let them feel the butterflies in their stomach. Of course, good food is more than a multi-sensory experience. Good food is nutritious, giving us energy, allowing us to think clearly, to run, to swim, to dance, to work, to play, to live. A good blog post is nutritious, too. And your task, as blogger, is to reinvigorate your readers. So, think about what might stop them from implementing your valuable tips. And in your final paragraph, take away these objections to jump-start action. Fire up your audience to change the world—one tiny ripple at a time. From 1997 to 2000, I worked in Hong Kong. Not long after I had arrived, my Dutch boss—a big guy—and his wife invited me for a special dinner. It was the first time I had quail. I love food (had you guessed?). But I am not a big eater. What could I do when the food kept arriving? I didn’t want to be impolite, so I kept eating, course after course after course. I got horribly ill that night. And I didn’t eat quail again for many, many years because it reminded me of being sick. Overstuffing readers is one of the most common blogging mistakes. Are you making your readers feel sick, too? Are you cramming too many tips into your posts? A dinner with 12 tiny courses (or was it even more?). Yes, it was special. But, to be honest, I prefer simple good food. What’s better than gambas al ajillo cooked by my husband? This dish has only 7 ingredients: butter, olive oil, sherry, garlic, chilies, lemon juice, and prawns. It’s perfect with a salad, French bread, and, of course, a glass of Spanish red wine. I could share countless writing tips to make your sentences flow better and to choose your words with more precision, but good writing starts with being human, with having a conversation with your reader, with being yourself. No need to impress with fancy dishes. Simple home cooking is delicious. What about the after-dinner conversation? As an introvert, I struggle with big Christmas dinners. Too much noise, and no real conversation. What I like best is a meal with a couple of friends (or just my husband) and a good conversation. That conversation doesn’t start with wanting to share my ideas. It starts with listening, and hearing what others have to say. No matter how much you want to share your ideas, a good blogger listens to their readers first and empathizes with their struggles. Because your most loyal readers don’t just come for tips. They’re looking for inspiration, consolation, a sense of belonging, a real connection with you. PS Thank you to Lucas at Backonimo for inspiring this post. Made me hungry for food, and hungry to start blogging again. Henneke I had no idea you spent so much time in Asia. How fabulous. Super analogy being a guide. As for zeroing in, we head back to our beloved Thailand in 1 week. Looking forward to daily lunch in the local Thai Buddhist vegetarian restaurants. Penang street food rocks! Yes, Penang street food is amazing. But so is the Thai food. Enjoy! Ever been to India? The street food is great here too. I’ve never been to India, it’s on my wish list! I loved the zoom in zoom out technique (and I am going to read your post on explanatory writing now). I need to work on it. Well, now I’m hungry! 😁 This was a master class of metaphor as story telling. Definitely a keeper! A nice little roadmap to follow. Thanks Henneke. Always enjoy your writing wisdom. PS. You missed an “s”. Thank you, Barry. How did that go missing? I’ve corrected it! Thank you for your helpful blogs. I really enjoy your style of writing and the insights you so graciously share. Thank you, JoAnn. Your comment puts a smile on my face. Happy blogging! Great post, Henneke. I think these 7 tips were the right ones. I especially liked how you provided links for further reading at the end of each tip. I’ll have plenty to read today. You made me want Thai food tonight! Yum, Thai food. We’re having spicy chicken wraps. Love your style and the excellent tips you share in your blog. Thanks for another good one! Thank you, Romay. I’m glad you enjoyed this one! I like your focus on recipes you can make in 5 steps with 5 ingredients. Henneke – I haven’t been to Hong Kong in over thirty years, but I still remember the food as well as you do. I’ll never forget when I was struggling to eat dim sum with chopsticks. A waiter walked up to our table, stabbed the dumpling with a toothpick, and handed it to me! Your tip called “Be a guide” is exactly how I write. I taught elementary school special education (non readers and English as a second language) from 1976 to 1980 and what I learned then I continue to use. When others say step by step they mean BIG steps not the tiny ones that I learned to use. Yes, teeny-tiny steps—that makes such a big difference. Pamela is great friend and supporter. Did you know she designed my logo in 2012? Your articles is oh so timely! I’m just now putting an infographic together on how much time outsourcing your blog to a freelancer can save you. When you consider SEO research, choosing images, writing meta-descriptions etc in addition to the “headlines, sub-heads, word choice, simple sentences,” why wouldn’t you want someone else to write your posts while you run your business? So enjoy (and apply) your words of wisdom. Thank you. A travellers tale, a gourmet food journey,( a little romance?) a scrumptious recipe and, oh! almost forgot, brilliant writing tips! Thanks, Henneke for sharing your wisdom and many talents. Yes, you’re right—there’s a touch of romance here. In Dutch, there’s a saying that love flows through the stomach. With my husband and me, that’s certainly true. We love cooking for each other, and in the early days of dating, we tried to impress each other with our cooking. How lovely, I love cooking too, and seriously appreciate good food beautifully cooked and presented. Must be a joy to have someone to share that with. My guy loves the good food and eating part, just not the cooking. I love the tantalizing “small bites” menu of blog writing tips you selected for this one. I think I’m getting the feel for less corporate, more human, in my blog writing, Henneke. But, I fear I may be overindulging and adding oh too many calories in some of my work! Henneke, I just adore coming over here. I always notice that your posts are like little, self-sufficient refresher courses for the weary writer. Pure goodness! This was exactly meant as a refresher course—with links to dive deeper into the tips for people who wanted to do so. Thank you for your lovely comment, Maria. I love the way your post itself illustrates your message. The one thing you didn’t follow up on is ”listening to your readers first”. I usually don’t get that many comments on my blog posts. But when I do, I try to really listen and follow up. What are your best tips for getting more comments and engagement from readers? 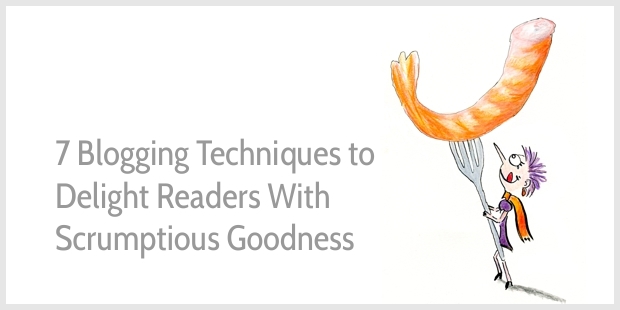 Listening to readers can also happen before they comment on your blog. When I started out, I would connect in forums to see what kind of questions people were asking. I also did a few Skype calls with early readers so I could get a better understanding of what they wanted to achieve, what they were struggling with, and how I could help. Thank you for stopping by, Bosse. Dear Henneke & Bosse, first I have to say I’m in Thailand as I type this, on business, & looking over a beautiful Bangkok skyline with a red wine in hand! But Bosse, to your comment – notice that Henneke has responded to every comment to her post! So simple, & so noticeable to her readers. How to get more comments? Honour the few who comment, & soon more & more will interact. Aww, you’re making me slightly envious… you’re in Bangkok! Awesome basics tips. And the food analogy was perfect! Thank you, Daniel 🙂 Happy blogging! Great metaphor, Henneke- we can all relate to eating! Just like with eating/cooking- we should write what and how we’d want read. Yes, food is such a great topic for conversation, isn’t it? We all have food stories to share. I like your idea of writing what we want to read. Thank you for stopping by, Richard. Yowza, I’m hungry. My husband and I went to Vancouver last specifically because of the authentic Chinese food (cheaper than returning to China). Love, love, love food. Another great post, Henneke! I’ve been thinking about another post of yours where you talked about inspiring readers with snackable tips. How many words per blog post do you find to be the sweet spot for your readers? When I went for the first time to China, I was amazed how good and varied Chinese food is. Each region has it’s own specialties. It was nothing like the Chinese food I’d had in the Netherlands. One day, I hope to travel to (and eat in) Vancouver, too! Most of my blog posts are between 1,000 to 1,100 words. I occasionally write longer ones, but just over 1,000 seems to be my sweet spot as writer, too. I have to say it’s a delicious post. I will have to add it to my blogging recipes. Thank you, Bosco. Happy writing! Such a yummy article. Thanks for the inspiration, Henneke! What a delicious post, it felt great to read and somehow I ended a bit hungry. Thanks for condensing the essence of blogging, I’ll be returning to this one for the friendly reminders we all need while writing. The gambas al ajillo is a favourite of my partner too hahah it made me smile as he isn’t Spanish either. Good to see you again, Virginia! You have a beautiful style of writing. It’s easy on the eye but more importantly it was easy on my mind. Your post content totally lived up to its headline. The analogy you’ve chosen between food and delivering value add content via a Blog post was instantly relatable. I think it’s one of the many issues ‘Domain Specialists’ suffer from when crafting their post content. Too often they are offended (as I was) when told to ‘Dumb’ the post content down. Expand on only one or two key ideas rather than crafting a Ph.D thesis in one post. Loved the Blog post. I took away a bunch of great ideas. Especially on how to ‘Place Ideas’ in front of an audience. Thank you, Ivan, for your generous compliment. I’m glad you enjoyed the analogy. And I agree with you—especially for Domain specialists, it can be hard to write clearly for people who are less expert. It’s so easy to fall into the trap of crafting a thesis in one blog post as you’ve so eloquently put it. Thank you for stopping by! Great post as always. I have always struggled with writing headlines. It makes me crazy. Also, will your husband share his recipe? That dish sounds wonderful. He uses butter and olive oil 50 / 50 (enough to let the prawns swim). Once the butter and olive oil are hot, add 2 large chilies (chopped and without seeds) and let the chilies fry for a few minutes. Then add juice of 1 lemon + an equal amount of sherry. Then add the sliced garlic (2 or 3 cloves) and leave simmering for a few minutes. Lastly, add the prawns and leave simmering until they’re cooked. Brilliant! So evocative and rich. When I’m struggling to find “juicy” language, I’ll turn to this as an example. Thank you, Deborah. This was such a fun post to write. Interestingly, I’d had this topic on my list for almost a year but didn’t feel inspired to write about it until now. Isn’t it weird how inspiration sometimes works? Happy blogging! Got your two books, which I absolutely love, as well as your newsletter. I find the writing like you talk tricky. Whether it’s finding my own voice (here comes the cliché wave), or not feeling like I can let go, I don’t know. Any ideas or tips to help my writing start sounding more like when I talk? I’ll give that a look. Good tips for blog writing. I am going to start my own blog. I was suffering from a pain of writing for so long. When I speak my heart fluently, many of my listeners say to me to write them down. But I struggle to write, Now I happened to stumbled at your feet and got some clues from your blogs and ideas of ways you presented. Wow, I want to start to do that. Also I wish to send you some sample articles. how can I do it? I really fell in love with your ways of writings. I’m sorry you’ve been struggling to write, Vishwa. But I’m glad you find this blog post useful so wishing you more writing joy!